We were pretty nervous last night when we received a tornado warning. One tornado was spotted on the ground to the northwest of us and another picked up on radar out of a severe thunderstorm. We were also under a flash flood watch with the possibility of quarter sized hail and 80 mph winds. Eeek! HAIL! That would about put us out of the seed business for 2019. So we laid in bed and watched the lightning flash steadily to the west. Wondering if we were in for it. I was also worried about David and Ashley, camped half a mile away, through the woods, in their popup camper. We were ready to go get them in the pickup if the storm got worse. Will got up at 12 o’clock when the thunder began shaking the house. Although we got a little wind and a little rain, that was it. The storm had passed us to the north. I’m wondering how it is at David’s work, Voyageur Log Homes, north of us. Yesterday their log yard was flooded two feet deep. It looked like a lake! And they got more rain last night from that storm. 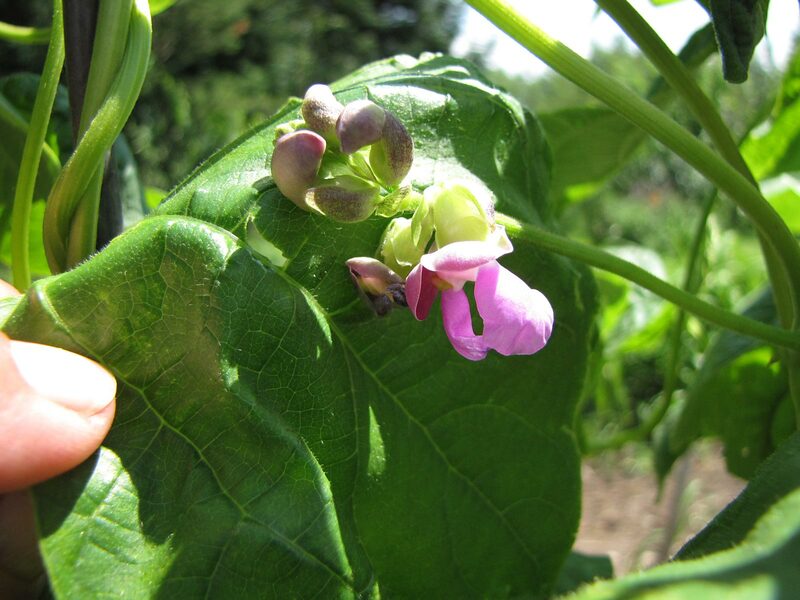 Look at the blooms on the Folsom Indian Ruin beans! The vines are covered. Meanwhile, our gardening continues. Will tilled the last of our pumpkins in the North garden and Alisha and I will go out this afternoon and mulch around them. Everything is growing so well! 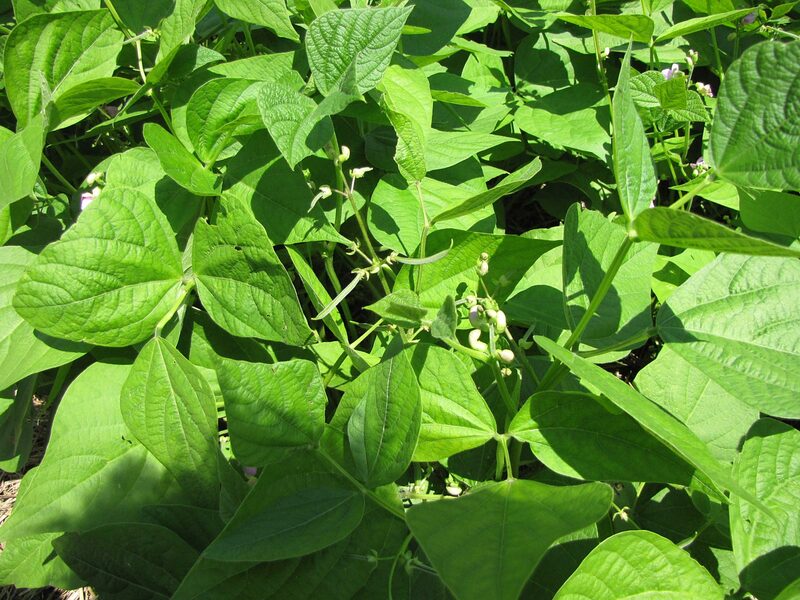 Take our Folsom Indian Ruin beans for instance; they’re completely covered with white blooms and tiny little beans. So are our Provider green beans. They’re so packed with little beans, we’ll be canning for sure in a week. Today Alisha is out picking wild blueberries on our ridge. They aren’t fantastic this year due to a last spring frost, but they are okay and we will be making jam tomorrow. The wild plums are much better, hanging nice and fat from the trees. We’ll be canning Provider beans in about a week — impressive. I love the blooms on the Crawford beans. Tuesday Ashley came home from work with new spark plugs and wires for her car. She managed to replace the front plugs and wires but couldn’t reach the ones in the back. (They make cars SO hard to work on today!) So when David came home from work, he went right at it and got them changed. David putting new spark plugs and wires on Ashley’s car. We were given some bean seeds from a customer that their family has grown for generations, called Crawford beans. 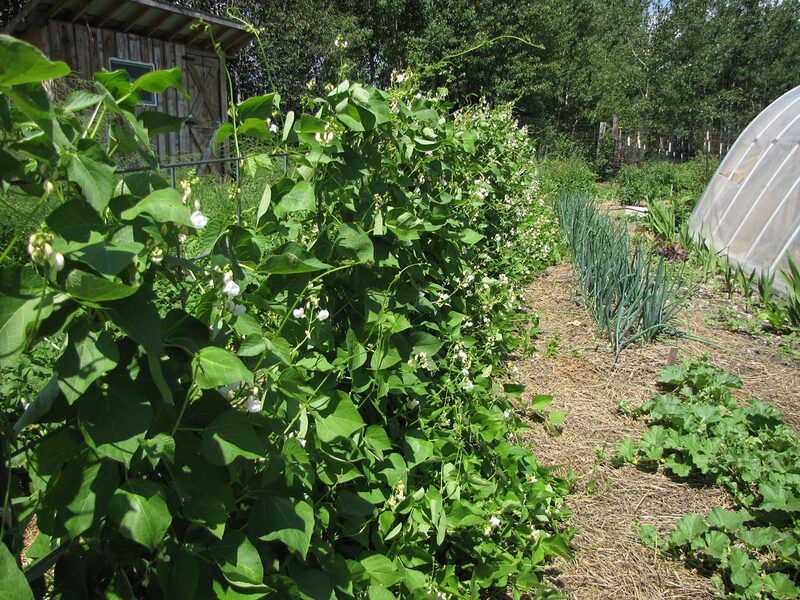 They are a lusty, old-fashioned pole bean with big, fat pods. I didn’t know they had such beautiful blooms! The blooms are like a garden flower. I love them. Very glad that the weather situation turned out ok for you! Your plants look SO fantastic! We’re so tickled with them. And we DID can Providers already! Hi, Jackie. I am glad you didn’t get the hail. That is the good side but the bad side is that it reminds you to put up twice the amount of seeds for the business just in case you have a “hail” of a season and don’t get any one year. You and Will work so hard on your own food source plus your seed business. Wow. You are an encouragement for us all. Oh, and wanted to say that my seed cucumber plants were maybe 2 inches tall when they went in the garden and are producing well. The store-bought 6 inch tall plants have not given me any cukes yet! The difference in seeds is this, I think: We love our plants and seeds and they seem to know it! We always try to keep extra seeds, just in case…just like we do our pantry. So far we’ve not had to use them but who knows??? years ago went to the mechanic. he came out and said he was changing the spark plugs on a new car. i said i wish i had a new car. he said, no, you don’t. this one you have to pull the engine to get at the plugs. can you imagine what that would cost? at least ashley and david were able to get to the plugs. i guess the outcry over the engines’ inconvenience back then brought design back into line with human capabilities, at least somewhat. Heck, my son, Bill, previously an automotive diagnostic technician, told me about one car you had to loosen the engine mounts and jack up the engine to change the OIL! Who the heck would think up something so stupid??? Just be glad you have the option of fall crops. With us, it’s spring crops or nothing. Talk about pressure! Hi Jackie and Will, we had a strike that was right in our yard last night. It for sure rocked the cabin. We got about 2″ of rain out of it. I’m not complaining about one drop however as in the Bagley area we can be wishing for rain in a weeks time. The honeyberry harvest was awesome even without you wonderful folks stopping in this year. We are finishing up the cherries tomorrow. A very heavy crop. Many will go unpicked as we don’t have enough U-Pickers stopping in yet and there are only so many we can pick ourselves. They are on the verge of going bad as we have the dreaded fruit flies in them at this point. Road work in Bagley hindered the pickers a bit too. Hope to see you guys this summer yet. Iowa to visit and hoping this storm watch does not get them! Good going! sorry about your son’s logs. dry at my house. last year I dug garlic out of the mud. this year very dry. they were damp after 3 weeks. won’t take long this summer. I’m enjoying the sun. We are so thankful that all is well and that the One above was watching over you all. Your garden is absolutely beautiful and am looking forward to next years seed catalog. So glad you are all safe and no damage to your crops. Yay!! I know this is a really busy time for all of you. It is busy for us too but I love refilling the pantry with delicious home grown food. Looking forward to reading your 4th book. Will start that very soon. Thanks for the blog and all the pictures you share with us. I look forward to it each week.